Bitterness is an interesting subject. For me it is as much a feeling as a flavour, something which can register on the palate in a number of ways, coming via indicators as far apart on the flavour spectrum as heavily roasted malt or lemon rind. It’s the reason that dark, dry, well attenuated beers can sometimes give the impression of high bitterness, despite the absence of high hopping rates from the recipe. Bitterness isn’t always about hops. It’s also the reason that Campari is such a painter’s palette of flavour for bitterness lovers. The king of aperitifs, where spikes of flavour thrust out at you with jolts of pungent, floral herbs, tart grapefruit peel and the astringent qualities of bitterly burnt sugar. The reason it works is that bitterness also has a refreshing quality, it awakens the palate and gives the impression of freshness. Where sweetness – at the other end of the flavour spectrum – gives the impression of thickness and stickiness, bitterness has a cleansing quality which makes you want to take another sip. A glutton for punishment going back for one more slug, hoping the next sip will quench the dryness left behind by the last, which it never does, until the glass is all but empty. Campari is of course a classic aperitif, drank by the Italians after work as a sort of boozy amuse bouche, designed to liven your tastebuds, and spirits, before the main event of dinner leisurely rolls it’s way around in the early evening. 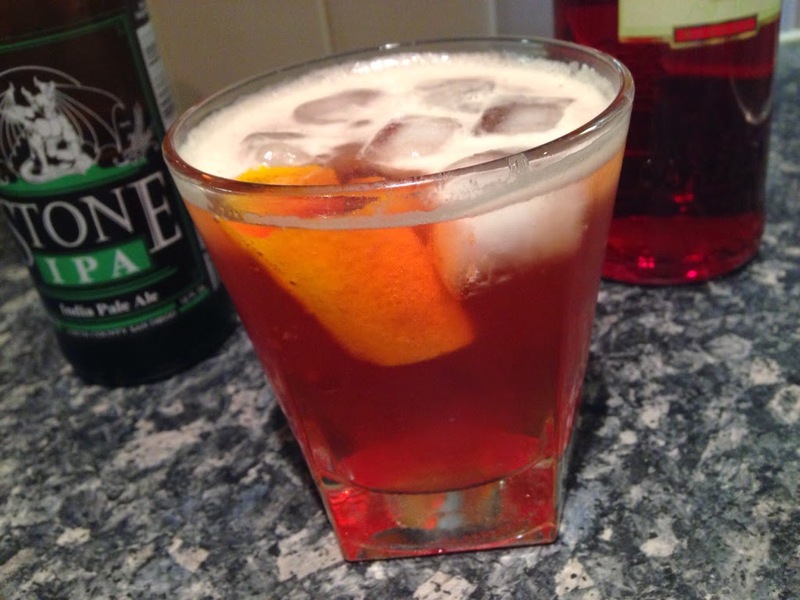 It is a key component in my favourite cocktail, the ludicrously simple Negroni, which the Polpo cookbook advises should always be prepared with equal parts Campari, gin and sweet vermouth, stirred together in a short glass tumbler with a slice of orange rind, “Don’t mess with these proportions. They are perfect as they are” it boldly claims – and I’m happy to agree. 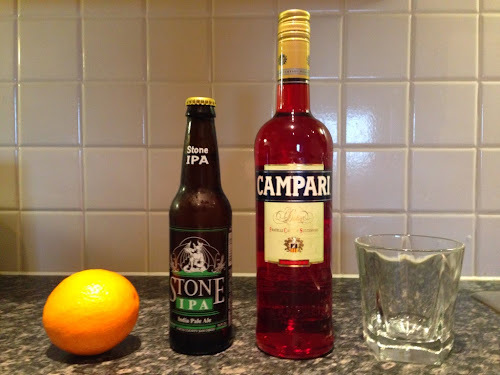 But Campari can be used in much more than Negronis, as can be seen quite spectacularly in the Campari and IPA spritzer, or as I agree it should be called, The CamparIPA, where the avalanche of bitterness that is Campari is tempered by the malt sweetness of American IPA, peppered with the added complexity of those dancing C-hops. The ingredients for the CamparIPA are simplicity itself, just a shot of Campari, poured over ice and gently stirred with roughly half a bottle of bitter American IPA, then garnished with a slice of orange or lemon peel – if you’re feeling fancy. I’m using Stone IPA but Lagunitas, Goose Island, or Racer 5 would all work perfectly well I reckon, albeit in subtly different ways. Freshly poured the first thing that hits you is the fizz, pine and hop bitterness, thrust out of the glass as it reacts with the ice, but then as you swallow your first sip the Campari wafts through your nostrils and that fierce herb and grapefruit character takes over. The finish is a dovetailing of the two with bitter pine, grapefruit, citrus peel and a kiss of sweetness creating a surprisingly balanced yet hugely complex cocktail. A beautiful combination, that I promise you is worth risking half a bottle of good IPA over. I discovered the recipe when reading an online article which linked to this: http://www.thekitchn.com/summer-cocktail-recipe-campari-ipa-spritzer-150343 - the recipe here advises using lemon, which I think would work well too, but I wanted the old-fashioned like sweetness of orange peel to counteract all that bitterness, hence my version above.